WASHINGTON (NNS) -- Secretary of the Navy (SECNAV) Ray Mabus announced that the future Arleigh Burke-class guided-missile destroyer (DDG 119) will be named USS Delbert D. Black after the first master chief petty officer of the Navy (MCPON) at a ship naming ceremony held at the Navy Memorial in Washington March 13. The ceremony was attended by numerous distinguished visitors, to include MCPON Black's surviving widow, Mrs. Ima Black, as well as the current MCPON, Mike Stevens. As Stevens introduced SECNAV to the audience, he hinted at the name of the future ship about to be revealed to the public. "I think it's safe for me to say that the ship that's about to be named will always be manned at 100 percent in the Chief's Mess," said Stevens. They won't have trouble keeping chiefs on it, but I know they will have trouble getting chiefs to transfer off it." After his introduction, SECNAV explained that the role of the office of the MCPON is to act as an advisor to the chief of naval operations and to represent Sailors and their families. "The MCPON doesn't just care for our Sailors and Marines though," said Mabus. Through partnerships with our spouse organizations, he also is the voice for the hundreds of thousands of family members. For them as well, he is an educator, a spokesperson, an advocate." Mabus went on to say that in 1967, Master Chief Gunner's Mate Delbert Black was selected to be the senior enlisted advisor of the Navy, a title later changed to master chief petty officer of the Navy. Mabus explained the significance of naming a ship after an individual, and why MCPON Black was chosen for this honor. 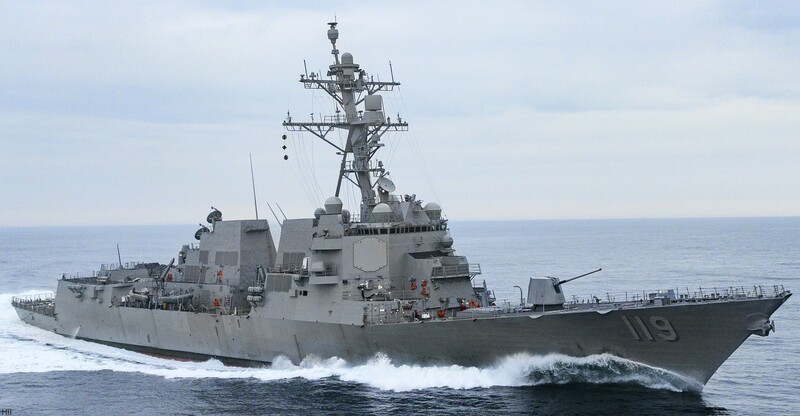 "In the Navy, per traditional ship-naming convention, our destroyers are named after naval heroes," said Mabus. A list of his tough duty assignments may give us a small glimpse of the service Master Chief Black gave to this country, but it doesn't even begin to cover the numerous lives he touched or personal sacrifices he made for his Sailors and our Navy. He is a true hero." Mrs. Ima Black, a WWII veteran of the Navy's Women Accepted for Volunteer Emergency Service (WAVES) was greeted with applause as she addressed the audience and spoke about what the ceremony meant to her. "Good morning Shipmates," she began. It's a beautiful day. A beautiful day to name a ship the USS Delbert D. Black. So let me tell you a little something about this wonderful Sailor that I was married to for fifty years. As has been said, he was a gunner's mate, so that meant that he spent a lot of time at sea. He loved the sea. I often wanted to ask him, who do you love more - me or the sea?" She explained that upon taking the office of the MCPON, her husband started from scratch, with no real formal direction, and laid the foundation of what that office has become today. "At the end of four years, the office was up and running and we were ready to retire," said Ima. We retired in 1971, and soon we heard that there would be a ship named the USS Delbert D. Black. In my heart I knew that one day this would happen, I just didn't know it would take so long. Thank you Mr. Secretary. And Mr. Secretary, when you go to Pascagoula, would you tell the shipbuilders to please hurry up, I'm running out of time!" Born July 22, 1922, in Orr, Oklahoma, Delbert D. Black graduated from high school in 1940 and enlisted in the Navy on March 14, 1941. Upon completion of recruit training in San Diego, California, he was assigned to USS Maryland (BB 46) and was aboard in Pearl Harbor on Dec. 7, 1941. Surviving the attack, Black's career went on to span thirty years, culminating in his selection as the Master Chief Petty Officer of the Navy on Jan. 13, 1967. Delbert D. Black was the first Master Chief Petty Officer of the Navy (MCPON), from 13 January 1967 to 1 April 1971. Black was born in Orr, Oklahoma, graduating from high school in 1940. He enlisted in the United States Navy on 14 March 1941. Upon completion of recruit training in San Diego, he was assigned to the USS Maryland (BB-46) and was aboard during the attack on Pearl Harbor on 7 December 1941. He later served at Receiving Station, Pearl Harbor; USS Doyle C. Barnes (DE-353); Naval Air Base, Samar, Philippines; USS Gardiners Bay (AVP-39); USS Boxer (CVA-21); USS Antietam (CVA-36); U.S. Navy Ceremonial Guard, Washington, D.C.; Yokosuka, Japan ship repair facilities; USS Brush (DD-745); USS Carpenter (DDE-825); USS Norfolk (DL-1); Recruiting Duty, Columbia, Tennessee; USS Springfield (CL-66); and Fleet Anti-Air Warfare Training Center (FAAWTC), Dam Neck, Virginia. During his career, he advanced from striking for the rate of Gunner's Mate to the rank of Master Chief. Upon retirement from active duty, Master Chief Black continued his involvement with the Navy through retired and active duty organizations. He was an active member of the USO Council of Central Florida; the Fleet Reserve Association; and Co-Chairman on the Secretary of Navy Committee on Retired Personnel. He died at his home in Winter Park, Florida at the age of 77. He is buried in Arlington National Cemetery, Section 11, Site 496 LH.